One type of carpet installation is the glue-down method. There are several carpet installation techniques used to install carpet on platforms, stairs and flat on the floor. Carpet can be a do-it-yourself project if you have carpeting experience or basic knowledge of carpeting techniques and carpeting tools. The technique you use to install carpet will depend on several factors, including where the carpet will be installed and what type of carpet you use. The most professional method of carpet installation on stairs, platforms and in single-level rooms and spaces is known as stretch-in. The stretch-in method involves the use of tack strips and carpet stretching tools to give the carpet a tight fit in the space. This is the method used by professional installation teams. 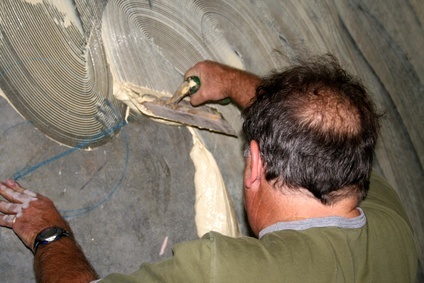 Two other methods for installing carpet involve the use of glue. These are referred to as the direct glue-down method and the double glue-down method. To install carpet using the stretch-in technique, an installation team needs at least two members and several tools. The tools for stretch-in installation include a power stretcher, knee kicker, tack hammer, carpet tacks, tack strips and seam tape. Other necessary tools include staple guns, staples, scissors and a utility knife. For the gluing methods of carpet installation, you will require a utility knife, scissors, seam tape, staple gun, staples, carpet glue and glue trowel. Tools for both methods are available for rent or purchase. The carpet installation techniques that work best differ for certain installation areas. Stretch-in installation works best indoors, where humidity is low, and on flat surfaces like floors and even on stairs. The stretch-in method should be avoided on inclines or areas where there will be a lot of rolling traffic from items such as hotel cleaning carts. The two gluing methods are best for areas with heavy wheeled traffic and ramps. Gluing is fine for areas with moisture, such as spaces covered with outdoor carpeting. There are benefits to each carpet installation technique. Stretch-in carpet installation increases the insulation in a home. It's easy to repair and easier and less expensive to remove than carpets installed using the glue-down method. The glue-down method minimizes bulking and buckling, allows easier access to floors and pipes under the floor, and it eliminates seam peaking. Before you choose a carpet installation technique, consider the size of the area where you will install the carpet. While stretch-in carpet is best for smaller rooms, glue-down methods have no size restrictions. Stretch-in techniques require the placement of tack strips along the edge of the room or space in order to secure the carpet into place.